AMERICANS love lists, even bad ones, which serve mainly to start conversations about what is and is not on them. Establishmentarians hate lists, unless they are the ones making them, especially as a marketing gimmick. The recent roster of the 100 best novels of this century, promulgated by the Modern Library division of Random House, met endless snickers among the culturally refined. The New Yorker mocked the very idea with a cartoon suggesting an even more outlandish undertaking -- it showed the Metropolitan Museum of Art dressed in a banner proclaiming "One Week Only! The 100 Greatest Paintings of All Time." But if learned panels can choose the 100 greatest novels, movies or even historically influential people, why not the 100 greatest works of art? Art world cognoscenti say it cannot and should not be done. There is too much art to consider. Visual art, unlike novels, movies and television, has been around since the beginning of recorded history. And artists seem to churn out much more than their peers in other disciplines. Van Gogh, for example, painted for only 10 years before committing suicide at the age of 37 but still left behind 2,000 paintings and drawings. 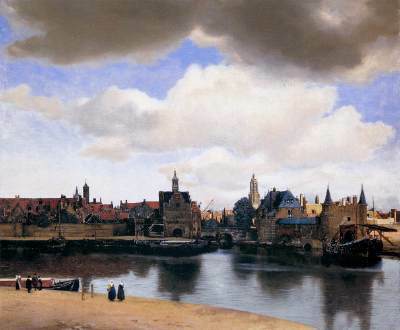 Vermeer, with just three dozen works to his credit, is considered a slacker. So maybe, some experts said, you could produce a list of the 1,000 greatest works of art, but no fewer than that. Each piece of art is unique and should be experienced in person -- which complicates matters. Many experts believe that the 16th-century Isenheim altarpiece painted by Matthias Grunewald is a masterpiece that should be on anyone's top 100 -- anyone who has made the trip to Colmar, France, where it resides. Even when art experts concede the inherent entertainment value of a list, they just don't think that the 100 greatest works of art promotes art the way parallel lists prompt people to reach for books and watch movies. That's because viewing art takes more initiative; you have to go to it. Arnold Lehman, director of the Brooklyn Museum of Art, has another objection. "By putting an object on a list, you're turning it into a precious commodity in a way that doesn't benefit art. People see the value, the dollar signs and who owns the object before they see the object. That cheapens this incredible, tangible expression of genius." But it may be too late. Two people who strive to popularize art are already doing the inconceivable. Thomas Hoving, the former director of the Metropolitan Museum, and Sister Wendy Beckett, the British nun whose television programs and books have made her a one-woman art industry, have separately compiled lists. Neither author follows the top-100 rubric to the letter, nor arranges the choices in any order, but it hardly matters. Mr. Hoving's book, titled "Greatest Works of Art of Western Civilization" (Artisan, 1997), promises to give readers "the pinnacles of quality, elegance and artistic strength, the best mankind has created, the hallmarks of unalloyed genius." "Sister Wendy's Favorite Things," a list of 75 items, is due out mid-1999. Her publishing company, Harry N. Abrams, declined to disclose exactly what will be included but offered a taste of her taste: classics like the bust of Nefertiti from 1360 B.C. and Pierre Bonnard's "The Open Window." Sister Wendy also wants to surprise, so she will include the Metropolitan's 16th-century carving of St. Anthony Abbot, a 19th-century Shaker table from the Philadelphia Museum of Art and George Stubbs's "Mare and Foals in a Wooded Landscape." Even from this scant evidence, a consensus emerges. Mr. Hoving chose Nefertiti, too, and Sister Wendy picked the same Manet and Vermeer paintings as he did. Mr. Hoving chose Michelangelo's "David," while Sister Wendy selected his "Creation of Man" in the Sistine Chapel. Peter C. Marzio, the director of the Museum of Fine Arts in Houston, is one member of the establishment who is not horrified by the whole subject. He even suggested two lists, one drawn up by experts and one voted on by the people. "I'd like to know what the general public thinks are the greatest works of art," Mr. Marzio said. "It would probably be Monet, Monet and Monet at the top. The one work that might make it on both lists is the 'Mona Lisa,' and maybe the bust of Nefertiti." Hmmmm. Maybe the whole idea isn't such a stumper, after all.